No morbid stuff, no demon either but some painting whose origin I don't remember AT ALL :) You may still see the meaning for it if you know that great movie Brazil. In a not so far future, technology has become so essential (and oppressive) that people trust computers more than their human fellows. 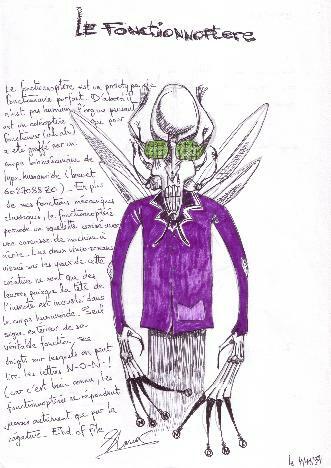 Here's my vision of a civil servant turned into some insect, with letters printed on his fingers allowing him to type just one word : NO ! Add comments : No that I have a closer look at this picture, it seems that this character really looks like Mister Smith from THE MATRIX, with his tainted glasses and nasty smile... Hey they copied me !